While military pay is relatively easy, there can be some tricky bits. 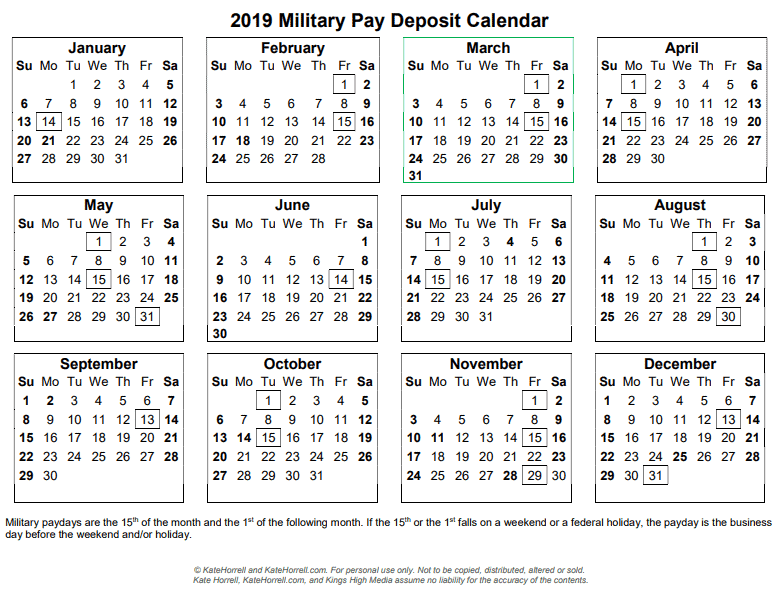 Military pay days are on the 15th of the month and the first of the following month, except when the 1st or 15th fall on a weekend or federal holiday. Then, the payday shifts to the business day prior to the weekend and/or holiday. 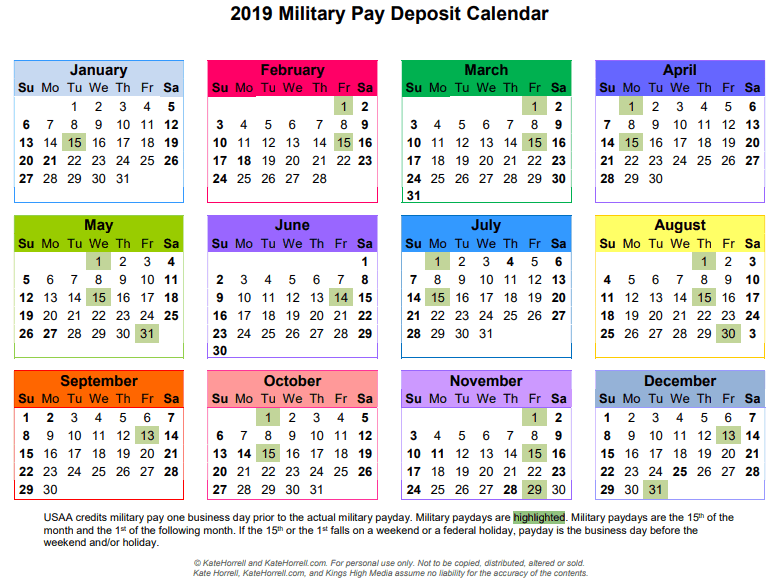 It’s important to note that many banks and credit unions offer early crediting of military pay as a benefit to their customers (and to entice folks to bank with them!) 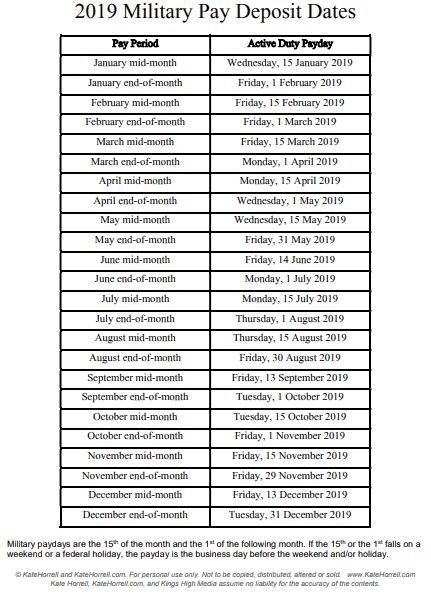 If your financial institution offers early crediting, this pay calendar will still be helpful but you’ll see your deposit a day or two before the payday listed here. I have created three types of calendars: a list, a black and white calendar, and a color calendar. You’ll have to scroll down to find the version that you want. Each calendar is available as a PDF, a Word document, or a Google Document. The Google Docs are locked, but you can easily make a copy for your own use by clicking on “File” and selecting “Make a copy.” You can also click on the image to make it larger, then save the image to your own computer. This year, I’m offering three ways to print these: click on the PDF or Microsoft Word link after the image, or click on the image to make it larger, then right click to save it to your own computer. Every year, I make at least one mistake on these calendars. I hate it. Please, please let me know ASAP if you see an error. You can email me at kate@katehorrell.com or use the link to the right to send me a message. Thanks for the calendar, I have a suggestions. could you add the date the LES is available. maybe do just like the pay date and just use another color for that date. Great idea, Tricia! I just published the calendars earlier this morning, but I will go back and add the LES later. It just won’t be for a little bit because I have to do the USAA calendar and the retirement pay calendars first, and these are way harder than they should be. I appreciate your idea! Always great info Kate! Thank you for all of your very relevant posts. Shared with the community at PCS Prepper! Thanks Rachel. I’m glad you find it helpful! Thanks so much for these. I am looking forward to the USAA one when you publish it. Hi! I know this the end of a busy year. When will you have 2018 calendar available? I found the 2017 calendar a very useful tool in budget planning.